There is no better promotion than word of mouth, and this is why the attendance of Riviera Nayarit to the gastronomic festival Morelia en Boca can be considered a success. Currently, the destination known as Mexico’s Pacific Treasure is being promoted via word of mouth, as people are talking about its natural beauty and its different flavors. Chef Betty Vazquez from El Delfin restaurant in San Blas, Marco Valdivia from Emiliano restaurant in Tepic and Gerardo Sandoval from Café des Artistes del Mar in Punta Mita presented not only the best of Riviera Nayarit’s gastronomy but also presided a Master Class in the festival, where they spoke about Pre-Hispanic cuisine and its evolution as it became in contact with the European and Asian cultures during Colonial times, thanks to the visit of the Nao de China to its coasts, and to the development of a new and modern cuisine that combines the most innovative techniques with the traditional flavors of this destination. 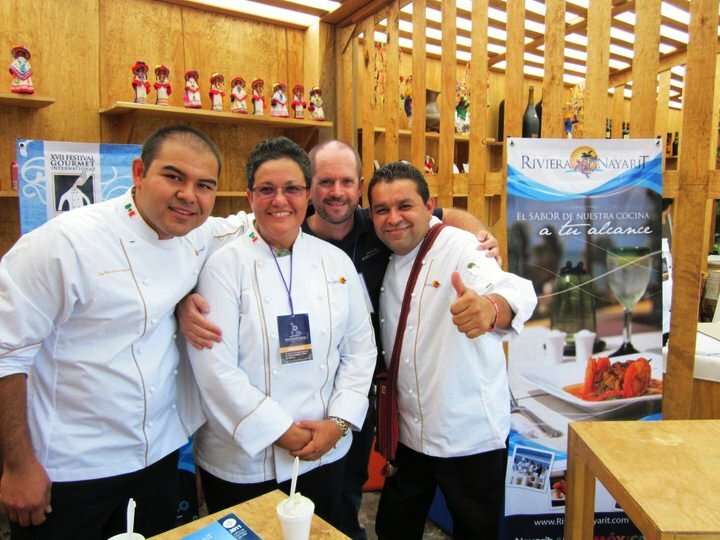 “I’m very impressed by the Riviera Nayarit team that went to Morelia en Boca and by their work. I’m also delighted by the fresh gastronomic proposal that their chefs brought to the pavilion and by the presentation and rhythm of their class, where they enticed and motivated the new generations. We already knew about the cuisine of these great chefs, but with their visit they renewed our hope in national gastronomy,” said Antonio Montesinos, General Manager of the Centro Empresarial Gastronomico Hotelero de Mexico. Canal 22, Codigo Cocina Mexicana, Caribean News Digital, Canal 40, W Radio and El Universal, among others, highlighted the presence of Riviera Nayarit’s team, and described the competitive advantages that this destination offers for those who enjoy gastronomic tourism. The Master Class of chefs from Nayarit was the most lauded, even though the festival had the attendance of personalities as Mikel Alonso and Enrique Olvera, who are heading the novel Mexican cuisine. The event was also used to promote the upcoming International Gourmet Festival, where 38 participating restaurants from Riviera Nayarit and Puerto Vallarta will present menus designed by host chefs and an equal number of guest chefs, including some of the most prominent in Mexico and the world. Riviera Nayarit is a destination that offers high-end luxury surrounded by an enviable natural environment where gastronomy is diverse and full of possibilities, and is sure to satisfy every taste.